September has been busy, but I have failed to get any pictures to attach to this report, except the last couple of days. I had three trips the middle of Sept., that was on the slow side, getting the most, 16-18 fish on those trips. The fish just would not bite. I will refish those trips, although I tried my best. The last couple of days, I have gotten limits with good fish, one trip taking a while and one done in an hour. Gary and Barb Neidenbah celebrated their anniversary catching fish on the 27th, and were off the water after we got our limit, and caught and released for a while. 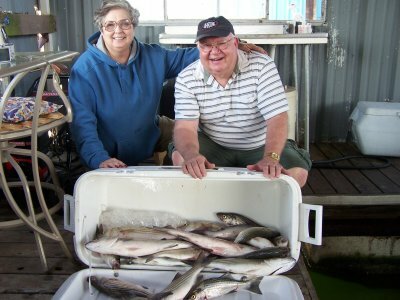 The catch is picking up, and I expect quick limits with good fish, through the rest of 2008. Good fishing…. "J D"